Congratulations to Molly Webb and the team at Demos for winning best think tank website at the annual Prospect Magazine awards, by developing a place for "transparency and discussion" with social software consultancy Headshift. Corporate, project and individual blogs; social tagging; RSS; wiki-based collaboration; podcasting... They're all in there somewhere - with good reason! I'm a bit partial because I've worked with Livio and Lee Bryant, and it was Lee's talk on blogs and bottom-up knowledge management a few years back that really got me started in this field. The site is clever because it is new-style item-centric rather than old-style page-centric, with each item (project, person, theme, event, publication, blog item etc) tagged so they can be mixed and matched just about anywhere. You really do feel you are getting into the knowledge undergrowth of Demos (well, the stuff they are tagging us about anyway!). It's easy to bandy about terms like open and transparent, in celebration of the collaborative approaches that the Net offers - but it is really difficult to make it work in the way that Demos and Headshift are demonstrating. They certainly deserve the award. It seems churlish to enter some reservation, but I confess that I did at first glance find the site a bit challenging. 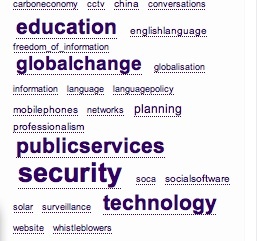 I'm pretty familiar with blogs, tagging and the rest of it, and don't feel smothered by a tag cloud (right). However, it is a touch overwhelming to find everything so Web 2.0. It's such a gormet tech delight it can be difficult to know which way to turn, and I wonder whether it may be rather challenging for people more used to traditional navigation. I think it is a problem easily solved. The one element so far absent (unless I missed it) is video on the site. What we need is a guided tour from Molly - or perhaps an avatar to guard against staff changes. It would then a short step to Demos in Second Life. I bet there's an award for think tanks in virtual reality under consideration somewhere. That really is a great offering; another Dan Dixon production classic. Well done all!